The Simple Secret to living Bohemian! 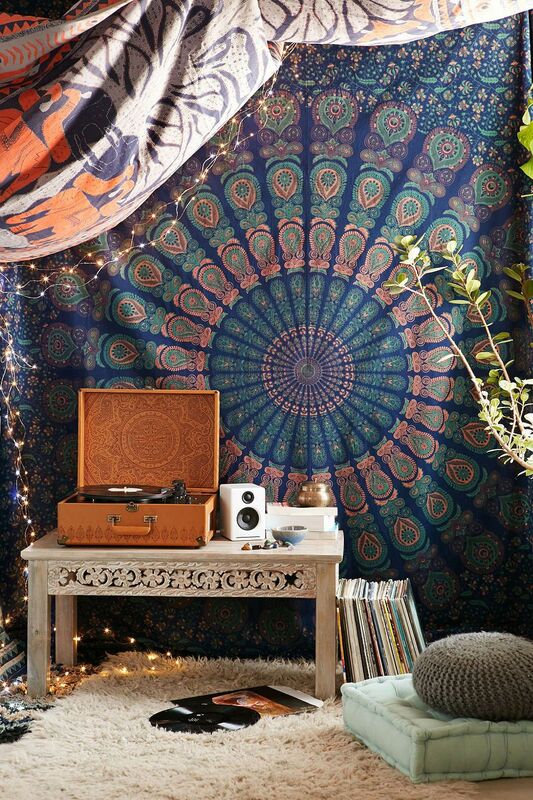 14 Signs that Your Home Style Is: Bohemian. What is Bohemian living like? 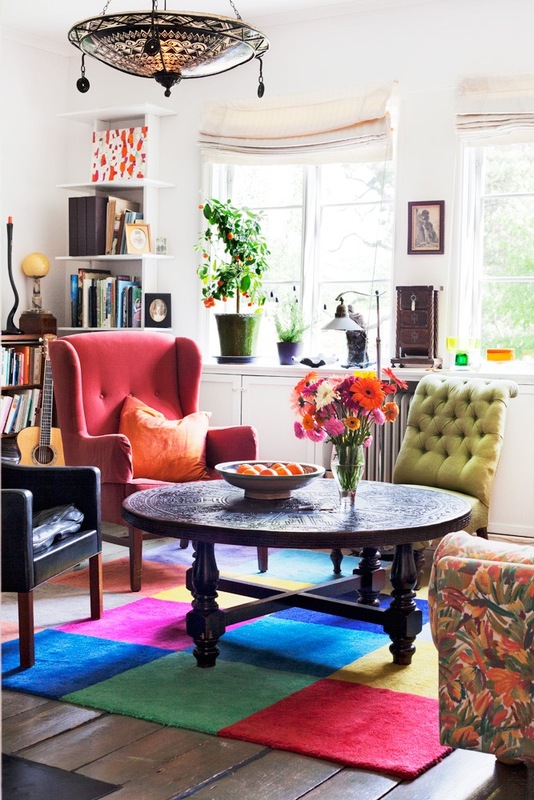 Pretend you are mixing modern and eclectic with splashes of color! This lifestyle is perfect if you are a fan of textures, patterns and anything vintage. 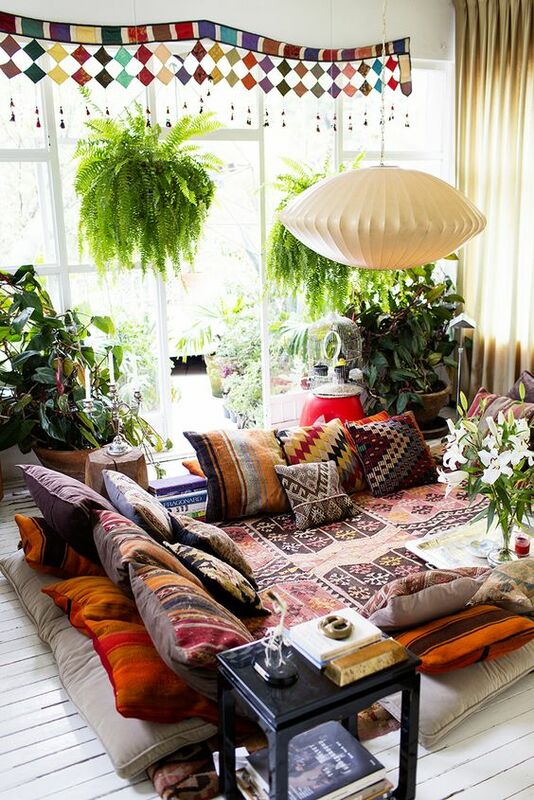 The fascinating thing about bohemian living is you can’t go wrong with anything! 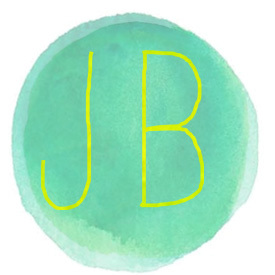 Live a life with free spirited home decor and I promise you won’t go wrong. This is the perfect definition of pattern love. Let’s just gawk over this patterned wallpaper for 13 minutes, or 3. Either way this wall screams “I don’t take life too seriously”! Don’t forget to create one great gallery wall just to spice things up a bit! 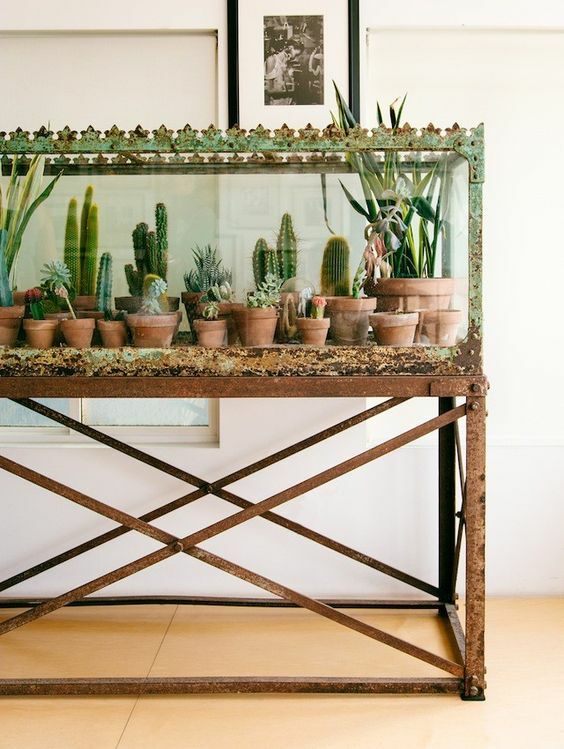 Nothing screams boho like transforming an old fish tank into an lovely cactus family. I love the look of this and I think it’s very clever. Make sure you find an old fish tank, the more rust the better. Who would of ever thought I would be recommending you search for all things rusty! Incase you were unaware, live plants scream gypsy/bohemian. There is just something magical about a house full of live plants. For the record did you know that there are tons of live plants that are very beneficial to your home? Click here just to be a few! If you are not a fan of real plants check this out. 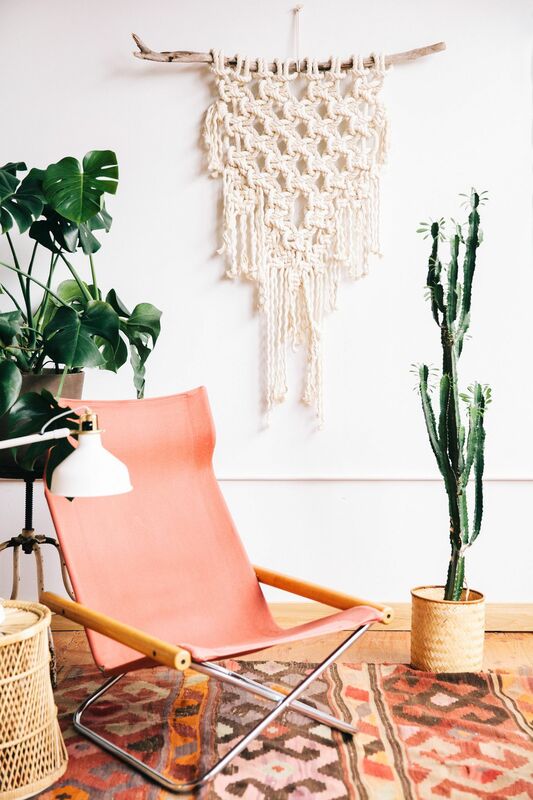 Patterned rugs are a must in any home especially if you are wanting to channel your inner bohemian self. 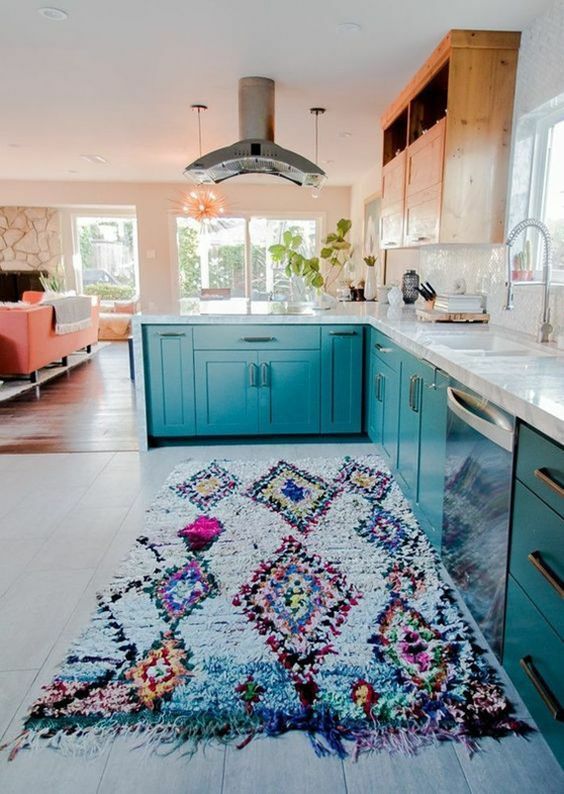 I love rugs that are filled with vibrant colors, you can throw this baby in any space and voila you just made your space so cozy you will want to put a pillow down and sleep on it! 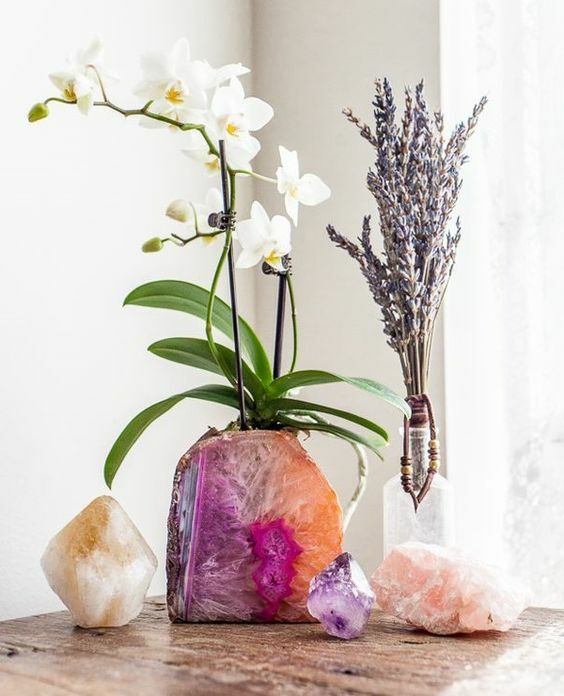 If you are anything like me and most beautiful souls in the world then you will have an underlying love for crystals, rocks or anything that is gleaming with love. Stone’s channel a lot of phenomenal energy and can change so much in your life! How cool are these agate planters! Macrame, period. On my last trip to Carmel Valley Ranch in California for the Michaels Makers summit we learned how to do macrame. I know you are prolly wondering how in the world I never knew how to do this by now. I guess I have no excuse, however now I do and I am in love. You can order one if you have no desire to learn the technique, but this is a must in your bohemian home! Make this dream catcher as well and you will “oooh and ahhh” all day and night! Mix tons of patterns together to get an instant boho feel. 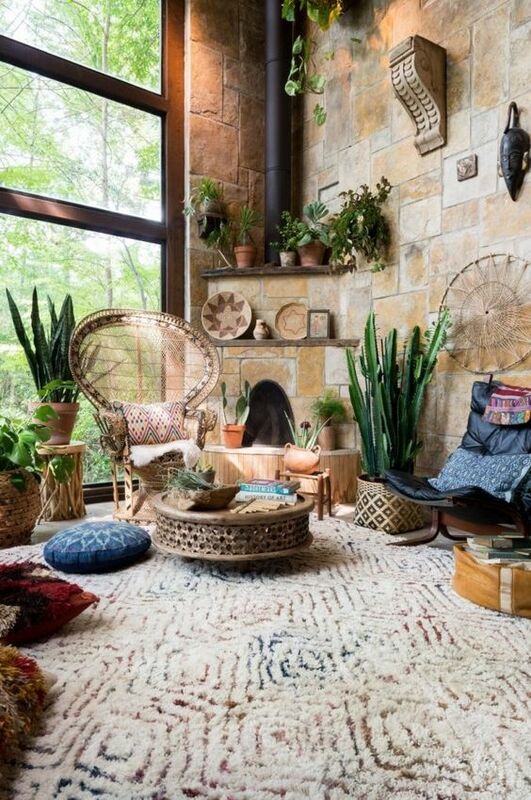 I know, I know most of you might say “NO, I like everything to match”… Well as we all know that is a delightful way to live just not the BOHO way to live. The more mixed patterns you have in your space the better off you will be, trust me! Now most of you will stash away all of your Christmas lights after he holidays, not us Boho humans. I think I have been keeping lights up all year long since I was a little girl. There is actually something more magical having lights up after the holidays than you could ever imagine. They add a magical aspect to ANY space you put them in, as you can see in the picture above! Make these and hang them by your lights and you have officially entered into boho territory! 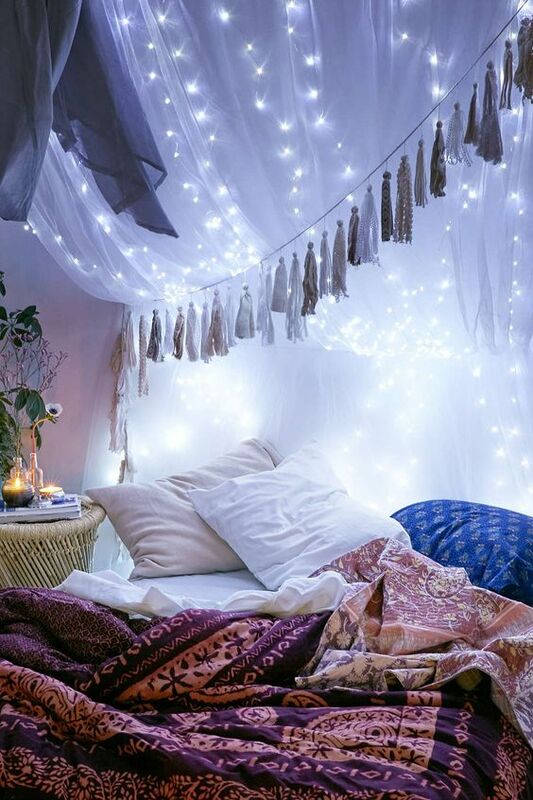 Let’s be real, tapestries are mostly known for throwing on top of a bed but in the life of a Bohemian soul they are meant to be hung from any given space. With that being said I mean from your ceiling, on your walls, as curtains and frankly anything else you can think of…Don’t forget the goal is to NOT match them, haha! Why not create a little nook in your home with different varieties of chairs that you can resort to when you need to center. This is also a great space to gather with friends or family! If you are unsure about mixing chair designs just hit up some garage sales or estate sales, you will never be disappointed. Keep an open mind and try to visualize the look you are going for before saying no to chairs! You can always spray paint them, then distress them. These could be added to the table as well. Good news! 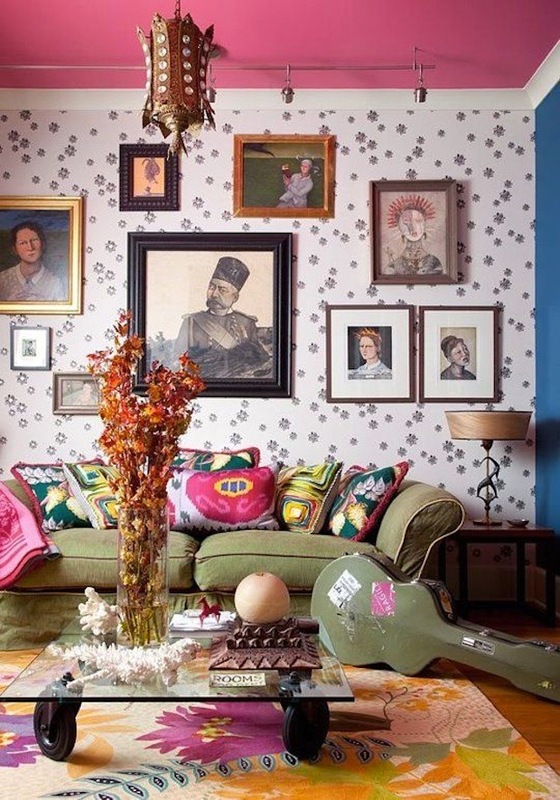 If nooks are not the thing for you then grab tons of vintage pillows for a “sunken” living room. Please tell me who would not love to let loose in this space! I love having a cozy spot to go to at the end of any crazy hectic day. Remember the bigger the pillows the better! Let’s be real here y’all…If you are still a fan of cans of chemical air freshener then today this will change for you! No, really! Those things are so bad for you and if you ask me they prolly cause cancer. 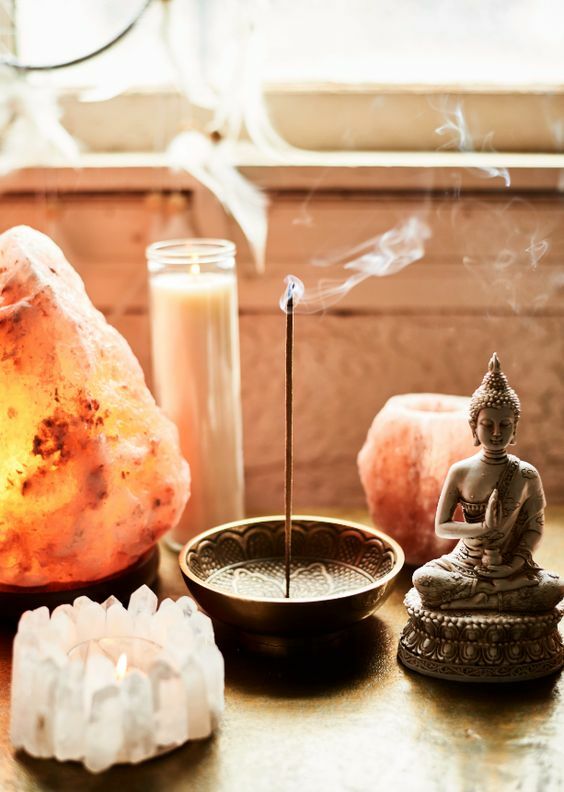 I love incense but I will tell you that if you are not a fan you can always choose a cleaner way of living by diffusing essential oils. Let me know if you are curious about Young Living Oils cause I got the hook up ( Just shoot me a message in the comments). Stash these around your incense to enhance the vibe. 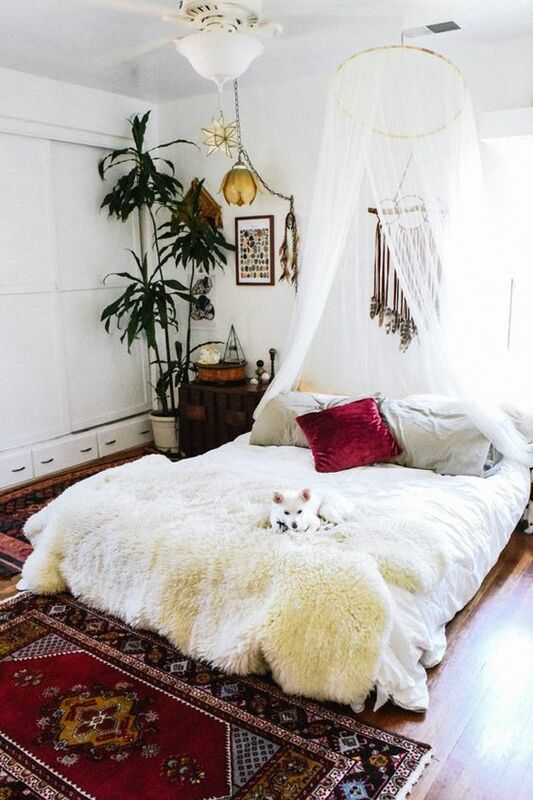 You can’t live in a space without small glimpses of luxurious sheep skin rugs. Now the great thing about these rugs, they literally look great anywhere! I think my favorite is when they are used as seat cushions on clear see thru chairs…Let’s just say our dogs love our sheep skin so much that it’s impossible for the human nose to get near it… EPIC FAIL (bc it’s huge), moving on now. Last but not least, the best way to make any space feel like peaches and cream is with an overabundance of fresh flowers. Preferably wild ones that are picked strait from the yard. I will say lately stores are starting to carry bigger varieties of unique flowers so you are not just stuck with generic roses. 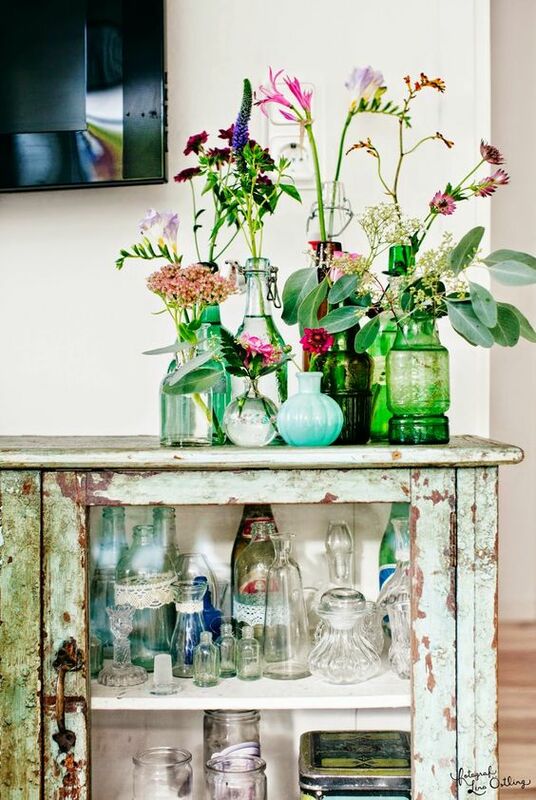 To make your flowers a little more bohemian you can throw them in old vintage bottles! By the way check out this easy way to make a flower crown in minutes! I cover almost all of them! 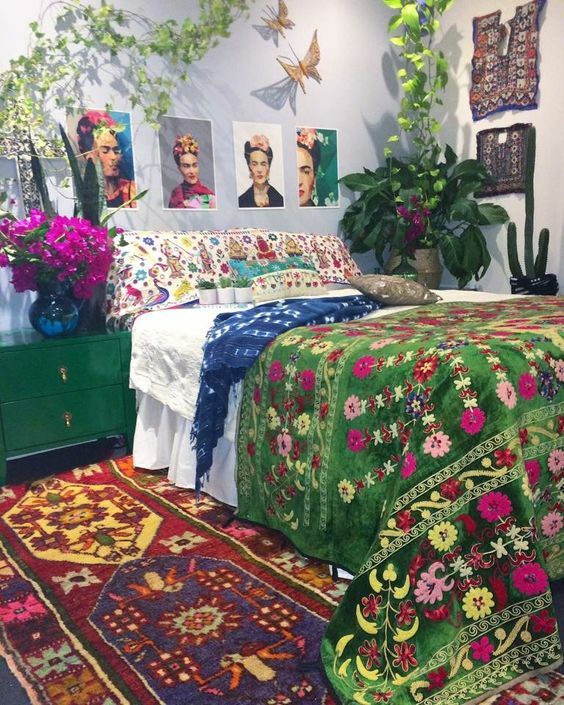 Thank you for sharing – for me the essence of any bohemian home are the rugs, plants and hangings on the wall.